Celebrating the life of Bugsy . Be the first to share your favorite memory, photo or story of Bugsy. This memorial page is dedicated for family, friends and future generations to celebrate the life of their loved one. Words cannot begin to express the amount of over whelming joy Bugsy has brought our family and friends. For 19 years he has been a best friend, son, brother, secret keeper, and so on. Age catches up with all of us. From sleeping under the Christmas tree to snuggling up with anyone who would sit still long enough. You will always be a blessing to our family, and we will cherish all the memories we have with you. For now, my dear Bugsy, just rest for we will see you again. We love you too the moon and back. November 13, 1999 - September 04, 2018. Gone from this world, but forever in our hearts. To send flowers or a remembrance gift to the family of Bugsy ., please visit our Tribute Store. 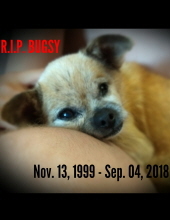 "Email Address" would like to share the life celebration of Bugsy .. Click on the "link" to go to share a favorite memory or leave a condolence message for the family.